Dont Just Clean. Luxor Nano CLEAN. Nanotechnology is the science of manipulating matter on Nanoscale (1 millimeter = 1 million nanometers). In the last quarter century, Nanotechnology has penetrated every field of science from biotechnology to robotics. One strand of human hair = 60,000 nm. There are as many nanometers in an inch as there are inches in 400 miles. There are two primary methods of generating Nano particles - Chemically and Physically, of which Luxor has perfected the Chemical process, which is also a wet chemical technique. Based on this technology Luxor has chosen to create products for Household & Industrial usage. Self organization of nano particles and building of nano layer barrier of nano particles on surface. (Tunnel Electronic Microscopic (TEM) view of nano particles on glass surface) . The biggest enemies of electronics is DUST! It settles, thickens & blocks important components. No matter what kind of duster you use, you dust your gadgets and dust often. Television & computer screens are magnets for dust & dirt. A screen can get dusty and grimy or be covered with fingerprints. What if you dont need to dust or clean your gadgets for 2 months? Mobile phones, Smart Phones, Palmtops, Tablets. Please note: Application of Luxor Nano Mobile / Gadget Cleaner and Protector does not harm the resolution or crystals of the respective screens. Cleans and also Protects against dirt, dust, stains. FIRST TIME in the WORLD. Contains specially formulated Gold Nano Particles. Repels Dust & Dirt Particles. Anti Static Property that reduces dust and dirt accumulation. Does not leave any residue or stains behind. Effortless Cleaning. Saves Cost. Saves Time. Use the Luxor brush to remove the visible dirt and dust from the edges. Use the Luxor microfiber cloth to clean the dust from the surface of the device. Spray Luxor Nano Clean Mobile/ Gadget Cleaner and also Protector on the Luxor Microfiber cloth and apply it on the Mobile/ Gadget. Wipe off with the clean & dry side of the Luxor Microfiber cloth until no streaks are visible. Make sure not to apply in excess. *Time required for best results: 5-10 minutes after application. 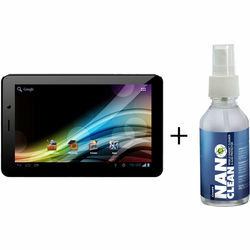 Luxor Nano Clean MOBILE / GADGET Cleaner & also Protector Dont Just Clean. Luxor Nano CLEAN. The Miracle called Nanotechnology Nanotechnology is the science of manipulating matter on Nanoscale (1 millimeter = 1 million nanometers). In the last quarter century, Nanotechnology has penetrated every field of science from biotechnology to robotics. One strand of human hair = 60,000 nm. There are as many nanometers in an inch as there are inches in 400 miles. There are two primary methods of generating Nano particles - Chemically and Physically, of which Luxor has perfected the Chemical process, which is also a wet chemical technique. Based on this technology Luxor has chosen to create products for Household & Industrial usage. Formation of Nano Layer The Sol Gel process Suggestive View Phase-I : Applying nano particles solution on the surface Phase-II: Gelling of nano particles and evaporation of medium Phase-III: Self organization of nano particles and building of nano layer barrier of nano particles on surface. (Tunnel Electronic Microscopic (TEM) view of nano particles on glass surface) . The Big Hassle The biggest enemies of electronics is DUST! It settles, thickens & blocks important components. No matter what kind of duster you use, you dust your gadgets and dust often. Television & computer screens are magnets for dust & dirt. A screen can get dusty and grimy or be covered with fingerprints. What if you dont need to dust or clean your gadgets for 2 months? Applications of Luxor Nano Clean Mobile/Gadget Cleaner & also Protector Suitable for all kinds of: Mobile phones, Smart Phones, Palmtops, Tablets. LCD, LED screens like: Computers Monitors. Televisions. Laptops, etc. Keyboards HD TV Touch Screens Calculators Any Screen, Luxor Nano Clean Please note: Application of Luxor Nano Mobile / Gadget Cleaner and Protector does not harm the resolution or crystals of the respective screens. Properties of Luxor Nano Clean Mobile / Gadget Cleaner and also Protector Cleans and also Protects against dirt, dust, stains. FIRST TIME in the WORLD. Contains specially formulated Gold Nano Particles. Repels Dust & Dirt Particles. Anti Static Property that reduces dust and dirt accumulation. Post application, fingerprints can be removed easily from the surfaces of the mobile phones and gadgets. Does not leave any residue or stains behind. Detergent free. Eco-Friendly . Improves Clarity and brilliance. Preserve touch screen sensitivity. Effortless Cleaning. Saves Cost. Saves Time. The Packaging The Blister Card contains: A 100 ml bottle Approx. 650 sprays per bottle A Luxor micro fiber cloth A Luxor brush Specially formulated with Gold Nano Particles How Mobile/Gadget Cleaner Works Using the Luxor Nano Clean Mobile/ Gadget Cleaner & also Protector is a three step easy process: Use the Luxor brush to remove the visible dirt and dust from the edges. Use the Luxor microfiber cloth to clean the dust from the surface of the device. Spray Luxor Nano Clean Mobile/ Gadget Cleaner and also Protector on the Luxor Microfiber cloth and apply it on the Mobile/ Gadget. Wipe off with the clean & dry side of the Luxor Microfiber cloth until no streaks are visible. Make sure not to apply in excess. *Time required for best results: 5-10 minutes after application.